Take a Tour of Insects World! Welcome to the Insects of Poland website! I'll be happy if you take a moment to view some photos from the life of insects. All photos are by me or my friends. If you'd like to use images for their own purposes do not be afraid to contact me. I like to see my pictures on friendly sites and in various printed materials. During the tour, you can use three display modes. Try to switch them using the "view mode" combo in the upper right corner of the page. » Explorer view - two columns. The list of families and subfamilies (tree) in the left column, the list of species and their pictures in the right panel. 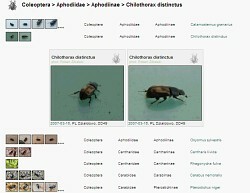 » Thumbnail list view - flat list of species with thumbnails. 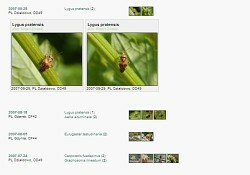 » Log-book view - pictures arranged by date (with thumbnails).